A fully illustrated learning and revision tool for all sailing and power boaters, with 160 graphics explaining the ColRegs, The International Regulations for the Prevention of Collisions at Sea (IRPCS). 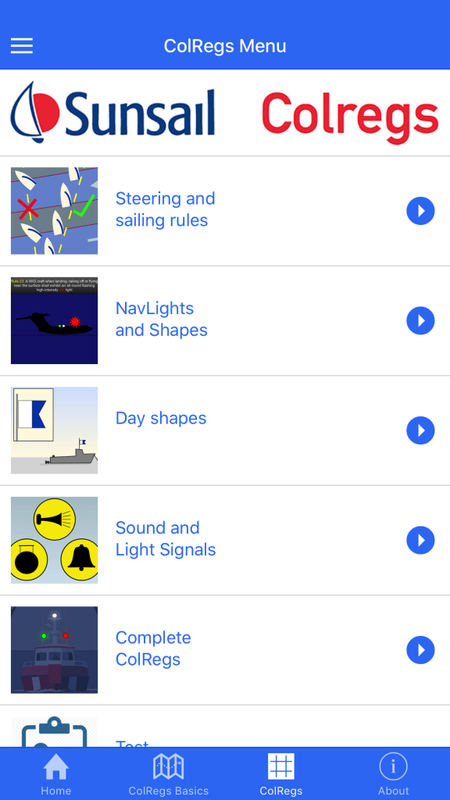 The SUNSAIL SAILING SCHOOL APP provides at-a-glance information to help all boaters learn how to identify other vessels and the activities they are engaged in, day or night. 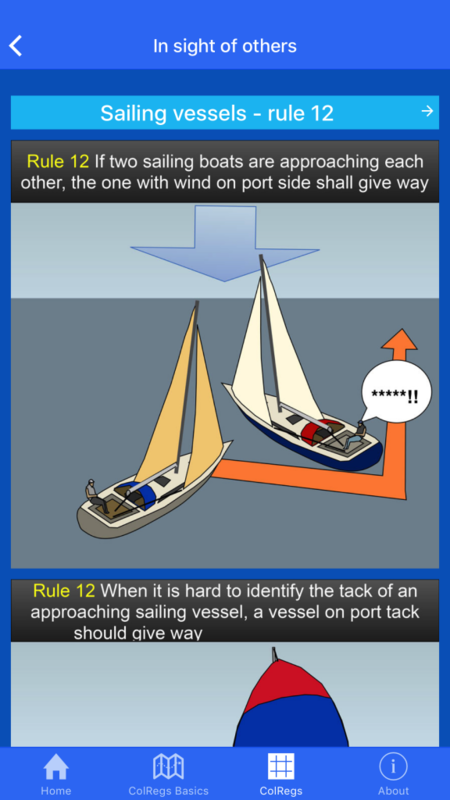 The app clarifies which vessels have priority, with explanatory graphics and captions, in addition to the complete rules. COLREG BASICS – the key rules all sail and power boaters should learn. 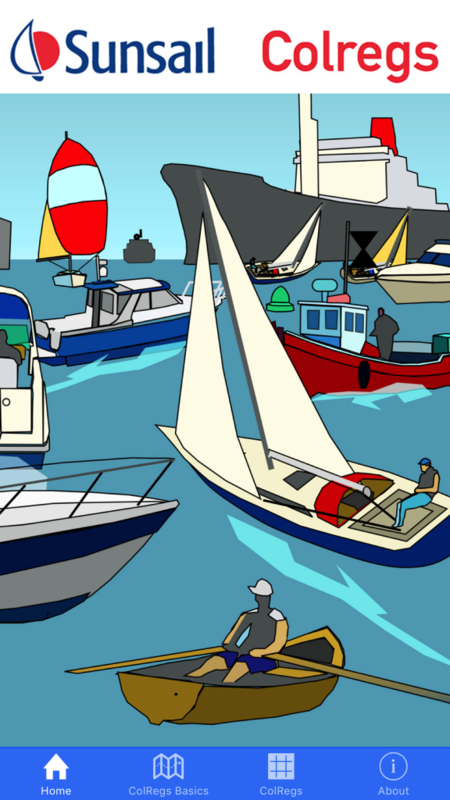 STEERING AND SAILING RULES – illustrated guide to the correct conduct of vessels in any visibility, in sight of one another and in restricted visibility. 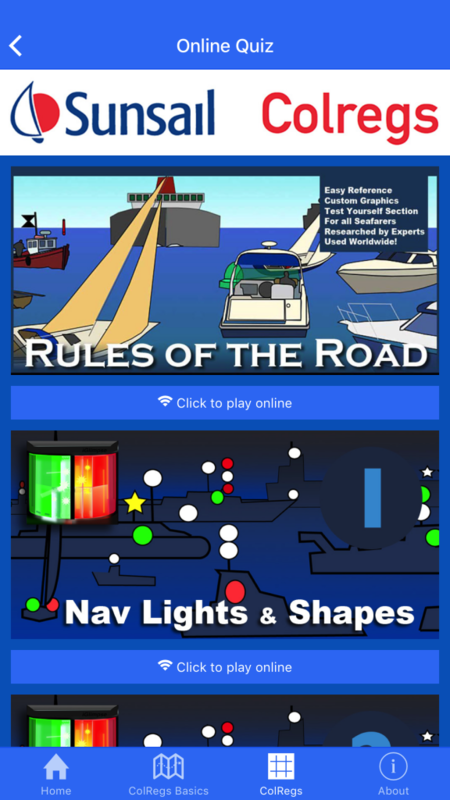 NAV LIGHTS AND SHAPES – illustrated guide to the navigation lights that should be used by the different types of vessel from sunset to sunrise and the day shapes that vessels should display during daylight. 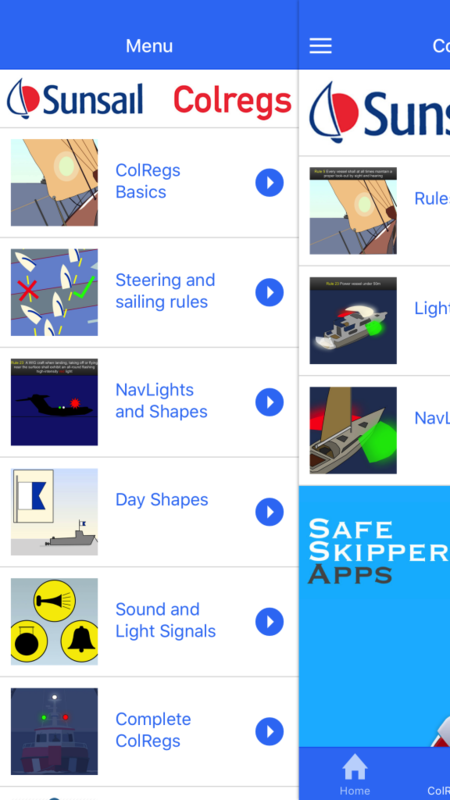 SOUND AND LIGHT SIGNALS – illustrated guide to the manoeuvring and warning signals, the sound signals to be used in restricted visibility and to distress signals. COMPLETE COLREGS – The International Regulations for Preventing Collisions at Sea (IRPCS) are reproduced in full. TEST YOURSELF – A series of multiple choice quizzes with graphic representations of the rules to help test your knowledge. – Easy reference learning and revision tool for day skipper and similar courses worldwide. – 160 graphics and captions for clear, accurate explanations of the rules. – Researched and produced by nautical and marine experts for accuracy. – Positively evaluated by professionals for reliability. – Interactive online “Test Yourself” Section. – Expertly drawn illustrations accompanied by clear, concise descriptions of the rules. 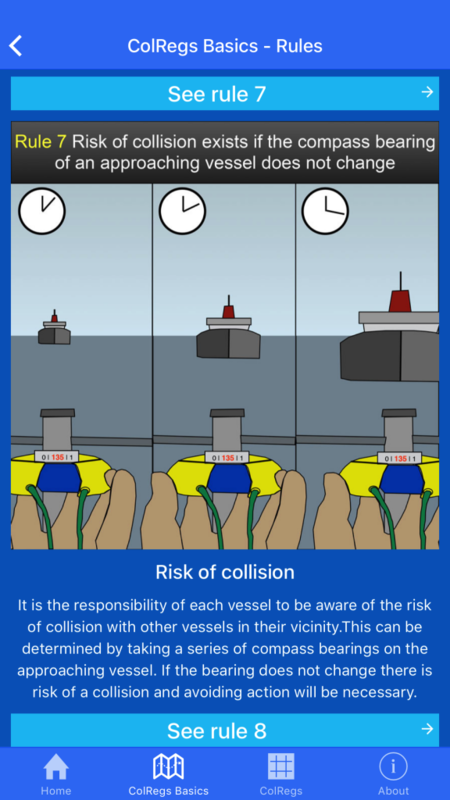 The International Regulations for Preventing Collisions at Sea (Col Regs) are a globally recognised set of rules which help to stop vessels on the high seas from colliding with one another . Anyone responsible for a vessel, from a small sailing boat to an ocean going supertanker, must be able to quickly identify other vessels around them day or night, whatever the visibility. They need to be able to quickly interpret the light signals, sound signals and shapes that help identify the type and size of a vessel, the direction in which it is travelling, who has right of way, and what action should be taken to prevent a possible collision. This is not always easy, especially in crowded coastal waters and harbours. The International Regulations for Preventing Collisions at Sea apply to all vessels on the high seas. For vessels navigating the U.S. inland waters, the Inland Navigation Rules apply. The U.S. Inland Rules and the International Rules are broadly similar but there are a number of important differences.  Following consultation with U.S. Coastguard officers, Safe Skipper Apps have produced the app Navigation Rules: Inland – for Boating and Sailing which explains the U.S. Inland Rules in detail. Thank you for choosing the SUNSAIL SAILING SCHOOL app.